I was feeling sort of heavy and rained on yesterday (we had a DELICIOUS apple fritter from glazed and infused at lunch) and I felt like a) baking (b/c of rain) and b) something healthy (because of heavy). 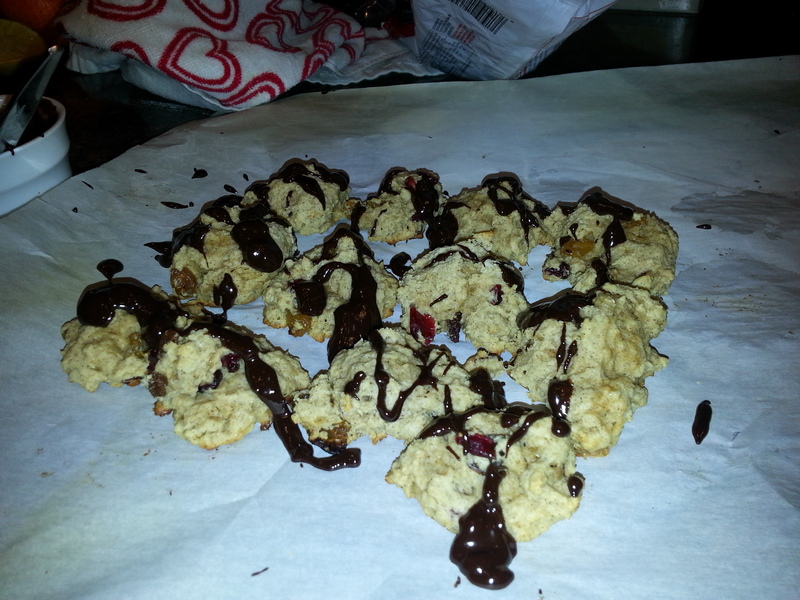 So I wrangled up my ingredients and took an extremely loose interpretation of a recipe I found on the internet for these incredible cookies. I love them, partly because there’s only 1/4 c of brown sugar in them. 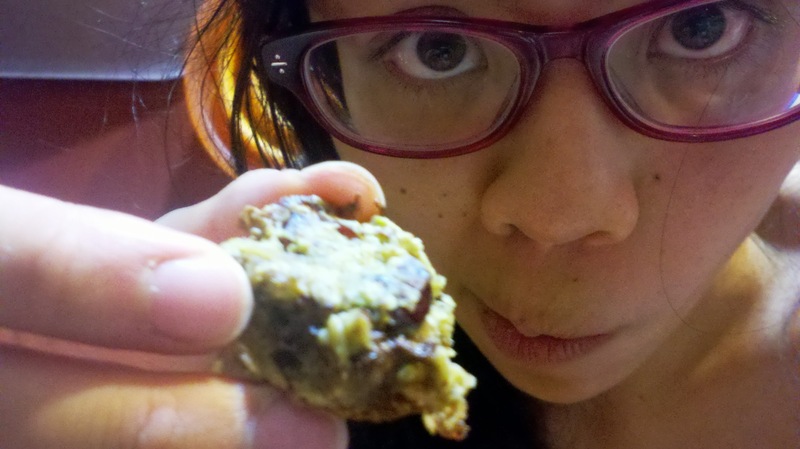 I think you could sub anything for the flour, especially coconut flour (use 1 c instead of 1.5) or whole wheat + oat bran. 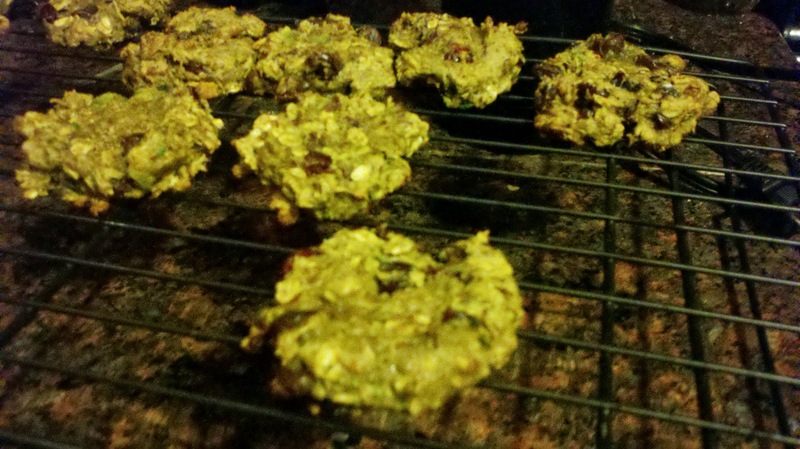 So what did I do for “healthy” cookies? 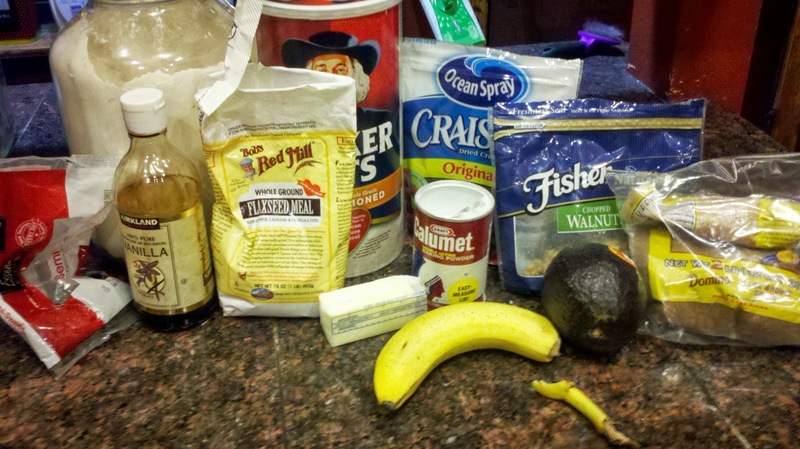 I threw in an avocado and a banana instead of butter/oil and more sugar. First, your flax gel- as usual, 1 TB ground flaxseed to 2 TB water, let set. 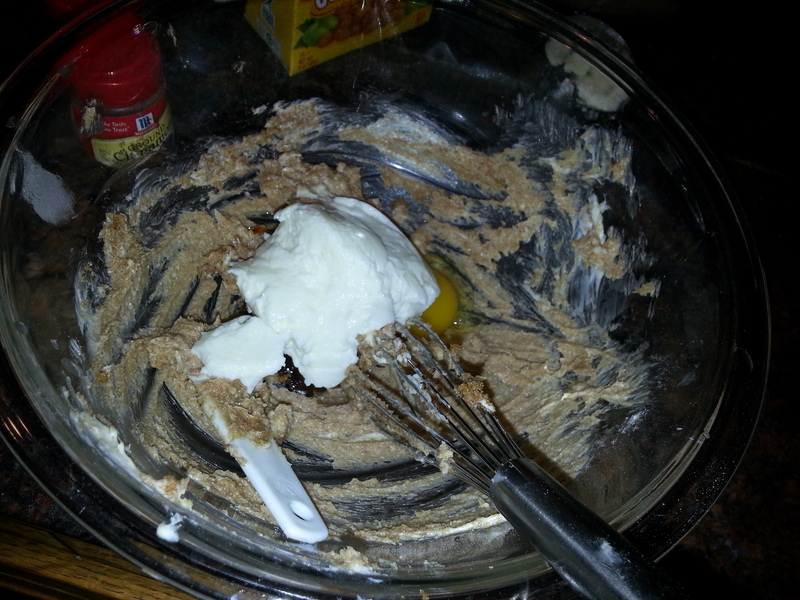 Most cookie recipes start with creaming the butter and sugar together. 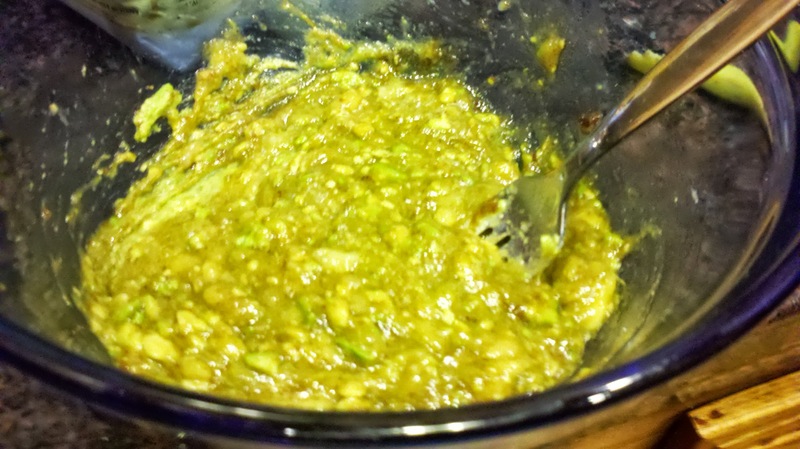 So for us, we’re going to use a fork and mash the avocado and banana together, and add a little bit of brown sugar (really not that necessary, could sub half as much maple syrup or honey). 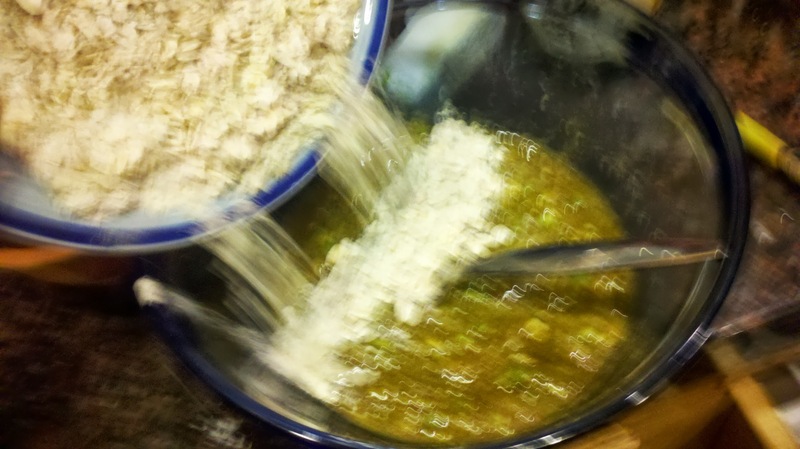 You want to mash until there’s no big chunks: some little chunks are fine. Don’t forget your splash of vanilla. 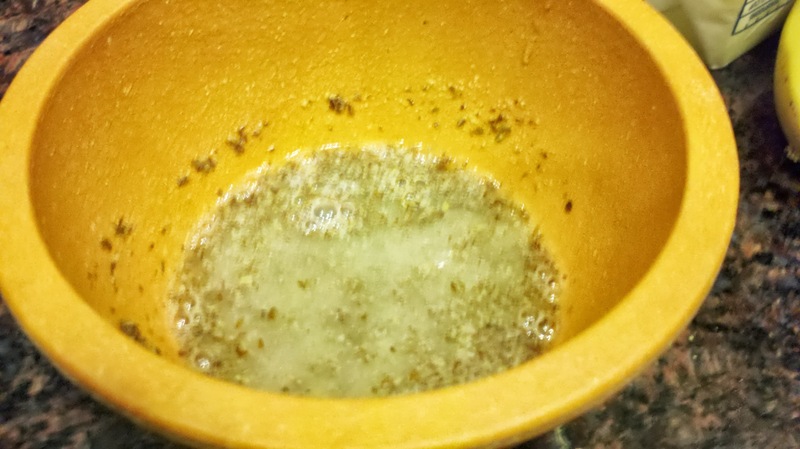 You can wait a few more minutes and do the dry before mixing in the flax gel, or just do it now. No big deal! 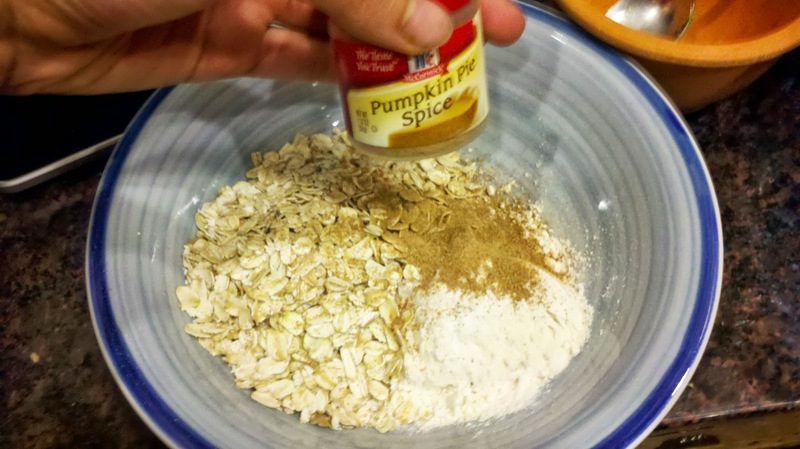 For the dry, whisk together your oats, flour, ground flax seed, baking soda, pumpkin pie spice (yum!). I never include salt in cookies, oh well. 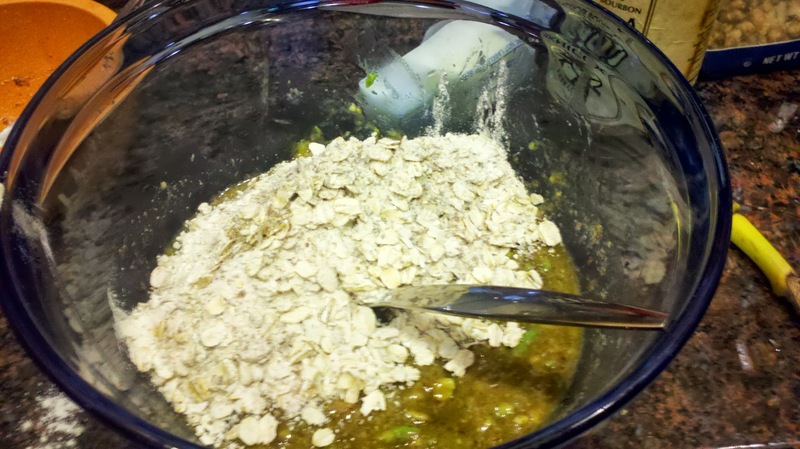 Often recipes say sift together, I don’t have a sifter, but for anyone who does, you just mix the other things and then stir in the oats. 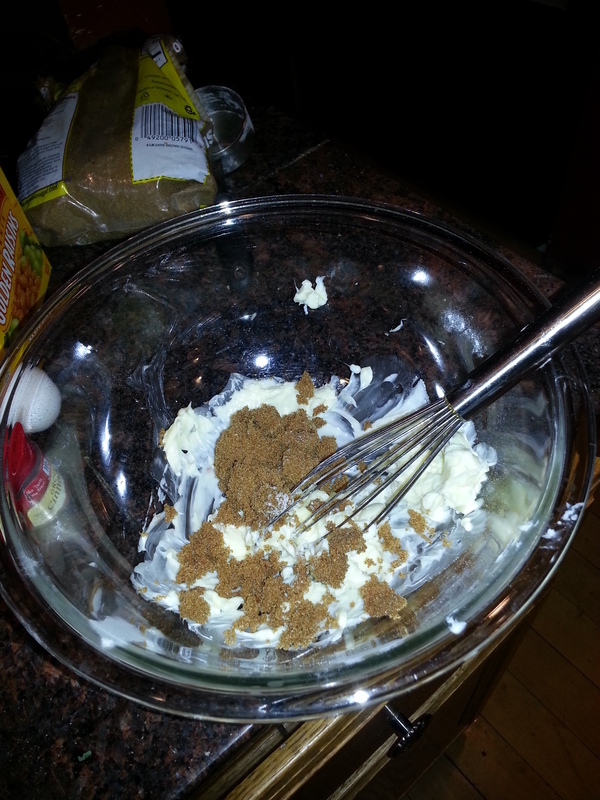 Then mix those dry ingredients in with your wet. ACTION SHOT! My brother’s giving me a camera for my birthday because I’m so frustrated with this phone. Since ‘one banana’ and ‘half a large avocado’ are variable measures, this batter will be somewhere between perfect and very very wet. 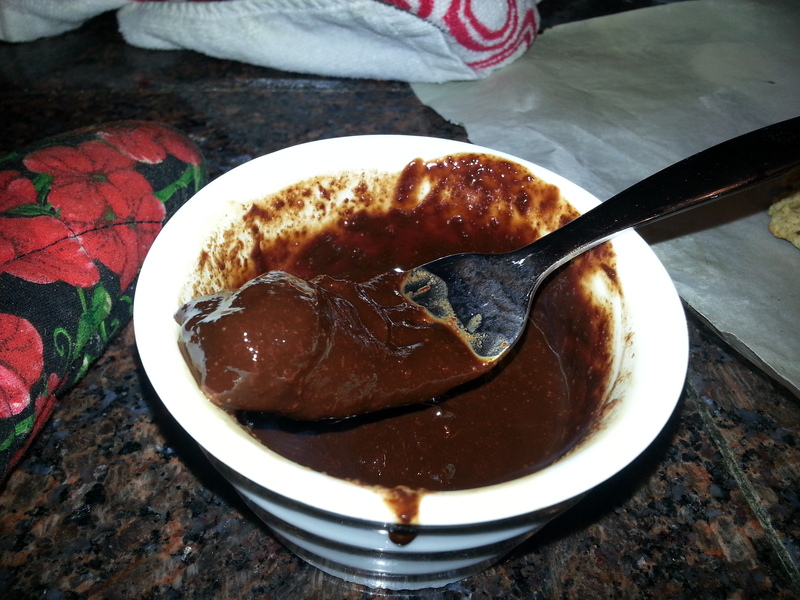 So just add in more flour a tablespoon at a time until it feels like wet cookie batter (I ended up using just under a cup and a quarter). 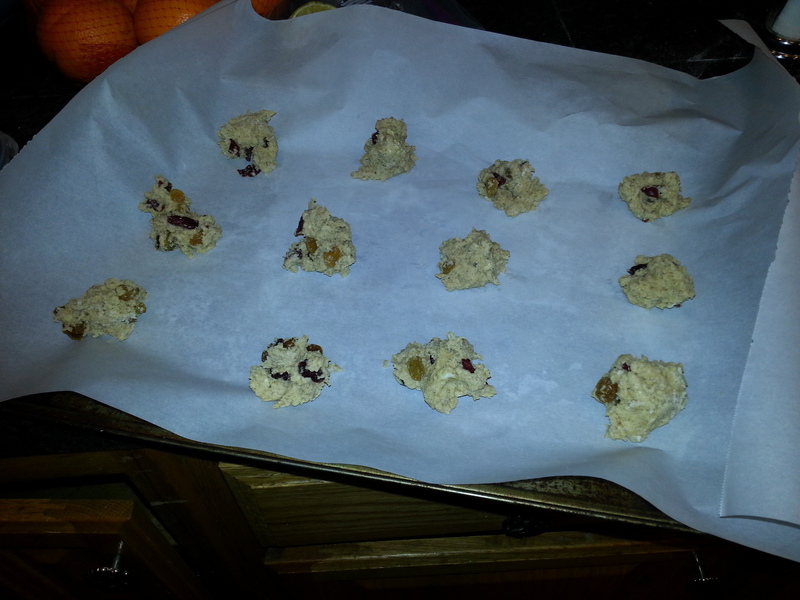 Then put in all your goodies: I did more cranberries, fewer chocolate chips because I ran out, and a bunch of walnuts. These goodies are driving me up the wall/nuts! 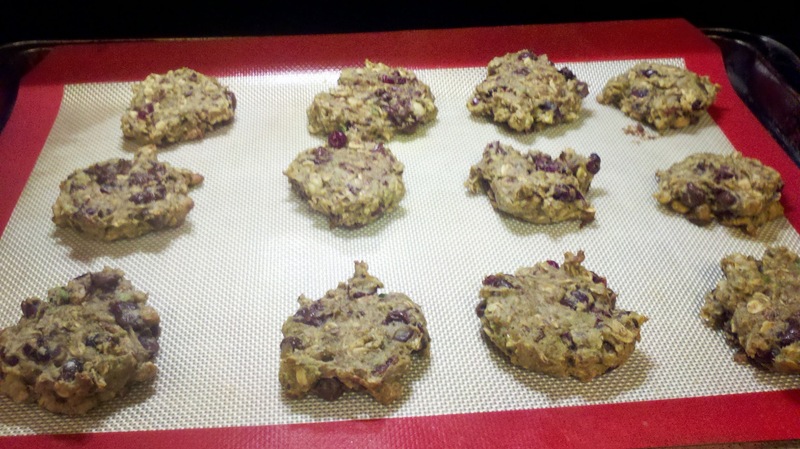 These babies don’t spread out much so you can easily fit a dozen tablespoon scoops of cookie on a sheet. Partway through cooking (or before you put em in the oven) use a fork to flatten them a bit. You can’t really tell when they’re done- just until it smells really good in your kitchen! I took about 13 minutes and checked at 9. Mix 1 TB flaxseed with 2 TB warm water, set aside. 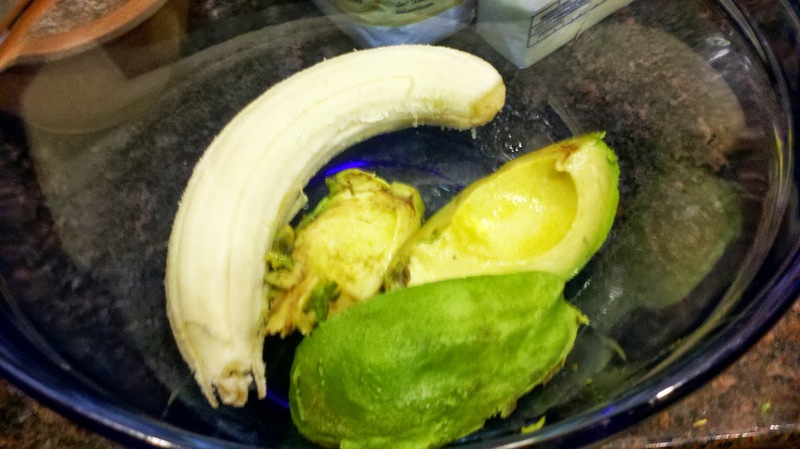 Mash entire banana with slices of avocado until you have about 1 cup (I used 3/4 of a medium avocado). 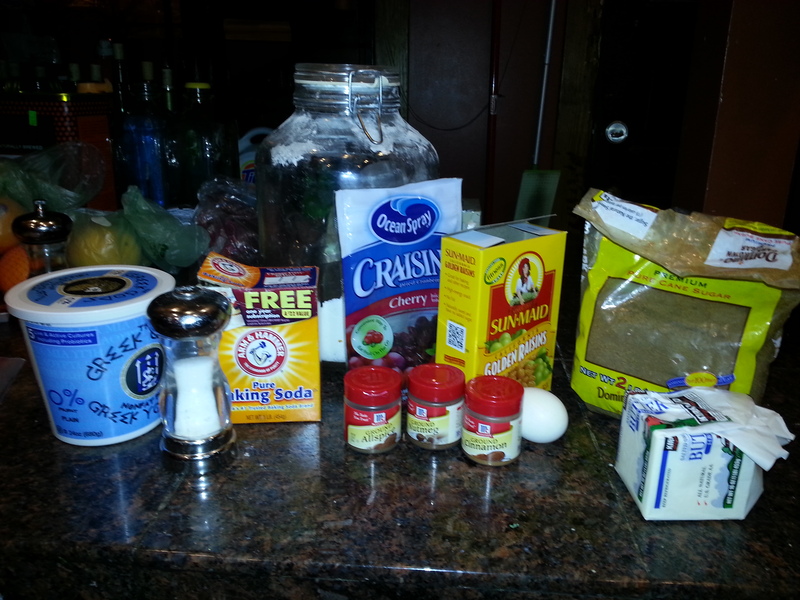 Mix in the brown sugar, flaxseed mix, and vanilla. 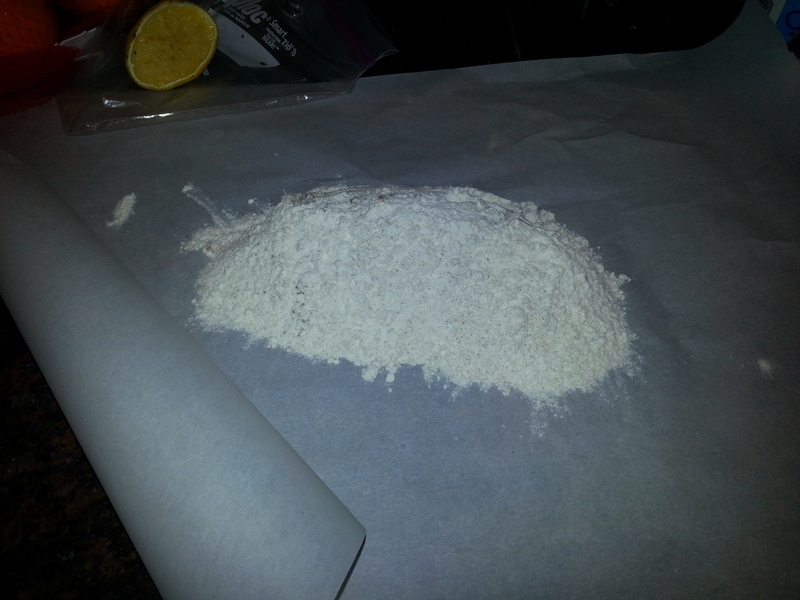 Separately, mix 1 c flour, baking soda, pumpkin pie spice, and oats. 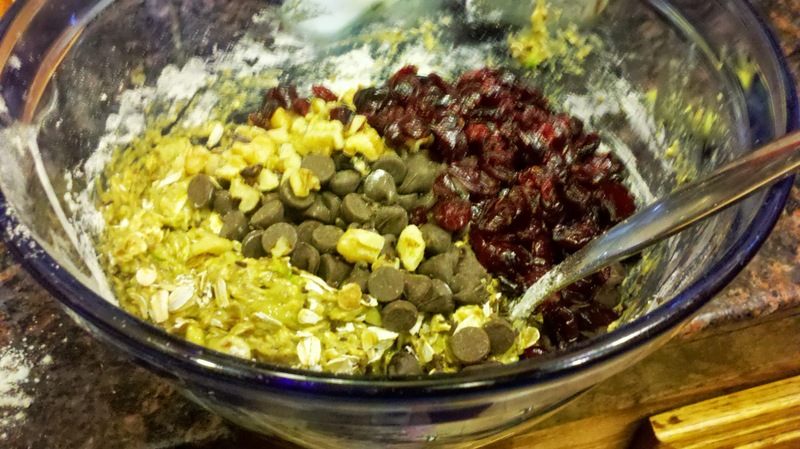 Add wet ingredients to dry, mix. 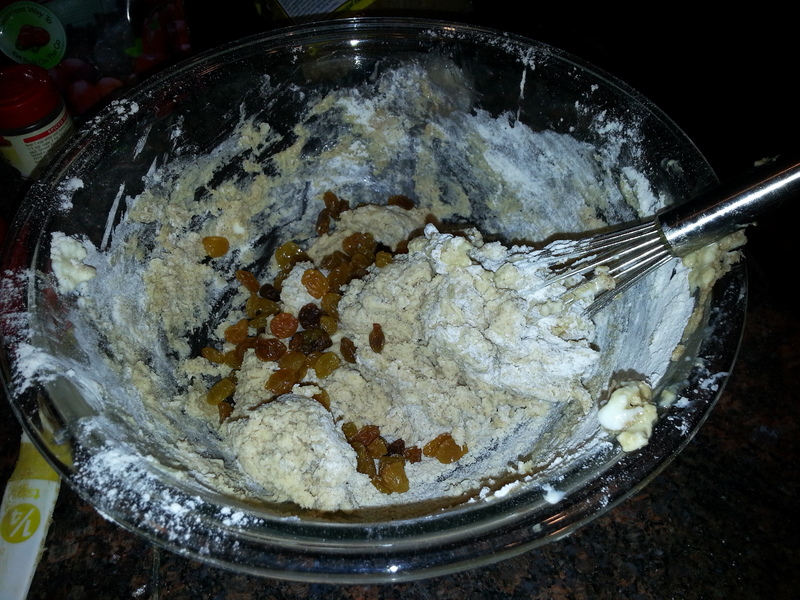 If too wet (likely) add flour 1 TB at a time until it seems like wet cookie dough (but not pancake batter/muffin batter). Drop by tablespoonfuls on cookie sheet, slightly flatten with a fork, and bake for 9-14 minutes or until it smells good and edges are lightly browned.